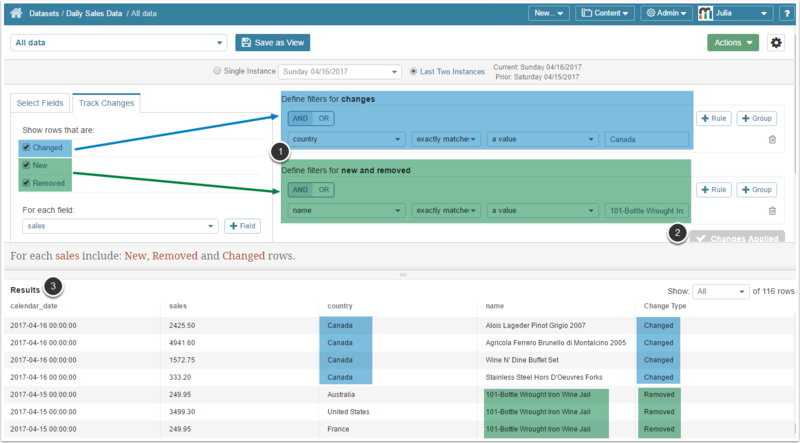 The following article describes how to track changes in paired datasets instances. Tracking changes in the Last Two Instances of this Dataset; e.g., yesterday's data compared to what occurred the day before yesterday). 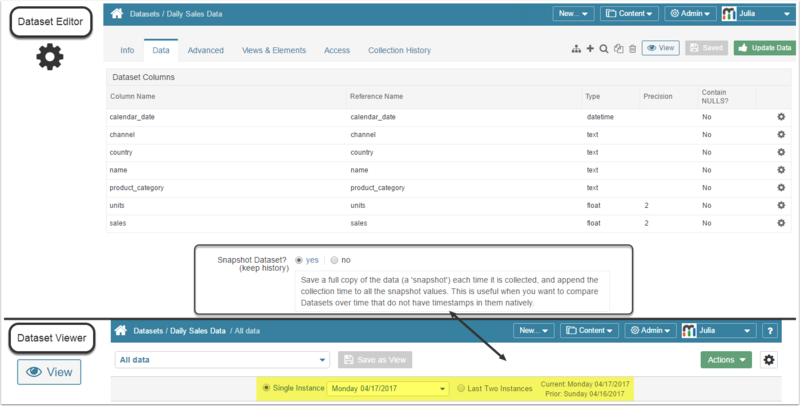 NOTE: You can compare ANY instance saved during previous data collections to its instance collected the day before. Example: In this example, the instance collected on Friday 04/14/2017 is used, meaning that it will automatically be compared to the instance collected prior to it on Thursday 04/13/2017. The Track Changes function allows fetching a selection of New and/or Removed and/or Changed rows. 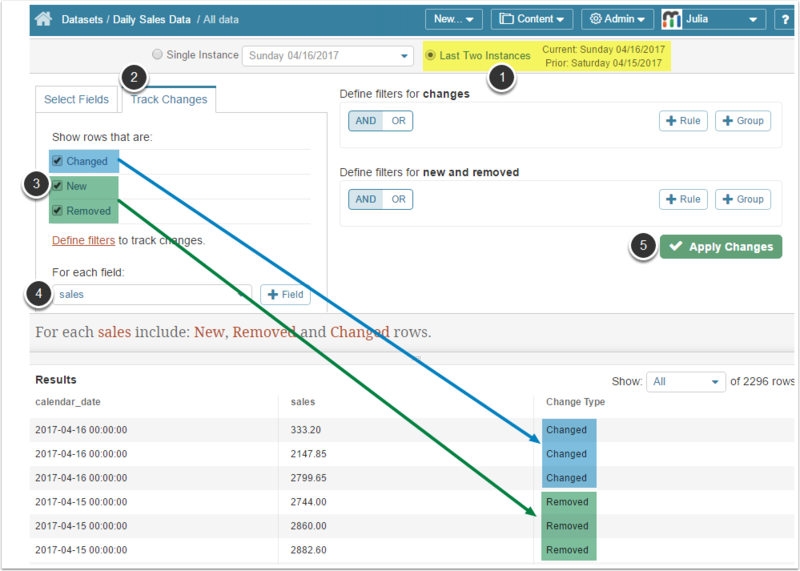 Whenever you choose to include more than one Type of rows' alteration; e.g., Changed+New, Changed+New+Removed, then each row in the Results set is assigned a corresponding label in the Change Type column. Results: Only those rows where the values defined during Step 4 have been changed / new / removed since collecting the prior instance are shown. NOTE: For detailed information on filters used for comparing instances, refer to: Applying Filters when comparing "Last two Instances"
You can apply different set of filters to the rows that are Changed and to those which are New or Removed. In the Results set, only requested rows have been fetched. Derived Fileds include values that do not exist in a Data Source itself but are calculated from one or more existing numeric fields via basic arithmetic expressions and non-aggregate numeric functions. When constructing a formula for a Derived field in the Last Two Instances mode, you can include the same field, but from current and prior instances. Derived fields with formulas including current and prior values become UNAVAILABLE when switching to a Single Instance mode. Derived fields can also be used to construct filters. In this case they are treated the same way as regular fields if the formula contains only current values (The drop-down lists in filters section will include current and prior value options). See the image below. Alternatively, if the complex formula of a Derived Field includes both current and prior values which are required for calculation (as shown above), the drop-down lists in filters section will include only current value option.